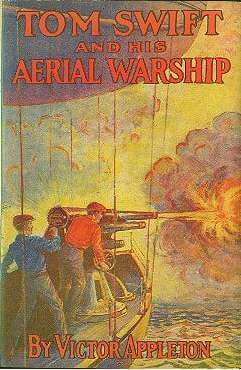 Tom Swift and His Aerial Warship; or The Naval Terror of the Seas (1915) was published in the midst of the Great War and was part of the popular juvenile science fiction and adventure series in which the main character creates amazing wartime inventions to save the day. In this story, Tom invents a huge airship for military use, and mitigates the problem of recoil on heavy weaponry. The Tom Swift series provided a bit of escape and hope during a time of fear and loss during the War.